British bhangra producers RDB (Rhythm Dhol Bass) pictured here with Bollywood actor Akshay Kumar and American rapper Snoop Dogg. They were brought together for the music video to a track produced by RDB for the Bollywood film Singh is Kinng. The film, which releases next week, stars Kumar as the lead, with Snoop Dogg making a cameo appearance. CHICAGO – Many immigrant children get even less vigorous exercise than their U.S.-born counterparts, the largest study of its kind suggests. Plenty of earlier evidence shows that U.S. children are pretty inactive. The new study of nearly 70,000 children simply found even lower levels of activity among immigrants. Almost 18 percent of foreign-born children with immigrant parents got no vigorous exercise on any days of the week, and 56 percent didn’t participate in organized sports. By contrast, 11 percent of U.S.-born children with American parents got no vigorous exercise, and 41 percent didn’t participate in sports. Given the obesity epidemic and immigrants accounting for about 13 percent of the U.S. population, the authors said it is important to know whether there are ethnic differences in physical activity and sedentary behaviors. They were led by Dr. Gopal Singh, a researcher at the U.S. Department of Health and Human Services’s Maternal and Child Health Bureau. Here’s how the researchers explain their results: Immigrant families surveyed were on the whole poorer than nonimmigrants and lived in less safe neighborhoods. That means they likely had less time for exercise and sports, and worse access to places to engage in those activities. But also, many immigrant parents place a high emphasis on reading, language lessons, studying and other inactive pursuits. Interestingly, earlier research found that immigrants tend to be less overweight and obese than people born and raised in the United States. That difference tends to wear off with longer exposure to U.S. culture including junk food and television. The new study also found that immigrant children generally watched less TV than American-born kids, although it did not look at obesity levels. Armstrong said it was the largest study by far to look at the topic. The study appears in Monday’s Archives of Pediatrics and Adolescent Medicine. It is based on 2003-04 telephone interviews with parents of children aged 6 to 17, including white, black, Hispanic and Asian immigrants. Singh said the results among Hispanics were particularly striking: nearly 23 percent of children in families where both parents were born in Spanish-speaking countries got no vigorous physical activity. Also, two-thirds of them didn’t participate in organized sports. Moreover, among Hispanics, U.S.-born children with foreign-born parents were less active than kids whose parents were both born in the United States. By contrast, among blacks and Asians, U.S.-born children with U.S.-born parents were less active than kids with at least one foreign-born parent. Dr. Mita Sanghavi Goel of Northwestern University said the results in Hispanics are troubling because of high rates of obesity and diabetes — both related to inactivity — among Hispanics, the nation’s largest immigrant group. “That just highlights how important it is to intervene early and set healthy lifestyle patterns early on,” Goel said. Rates for other immigrants who got no vigorous activity were 13 percent for blacks, almost 10 percent for whites and 7 percent for Asians. For no participation in sports, the rates were 49 percent for blacks, 38 percent for Asians and 32 percent for whites. The authors said more research is needed to verify results in Asians because relatively few Asians were studied. Among all immigrant groups combined, 65 percent got regular physical activity, versus 75 percent of U.S.-born children whose parents were both born in America. Regular physical activity was defined as getting at least 20 minutes of vigorous exercise such as running, swimming and basketball at least three days weekly. That was the minimum amount the government recommended when families were surveyed. Newer government advice recommends an hour of moderate-to-vigorous exercise most days. Just last month, a study found that fewer than a third of U.S. 15-year-olds got even that minimum amount. The authors acknowledged that parents may not always know exactly how much activity their children get, a potential limitation of the new study. So this is an email from my friend Baba, who is a diehard Amitabh Bachchan fan…enjoy! Good Afternoon to one and all!! I hope you are doing well and had a GREAT weekend!! This past weekend, Me and Waqas went to Houston to go see the Amitabh Bachchan concert in Houston. I have to tell you all that it was truly one of the best concerts I have ever been to and seen. We left for Houston on Saturday afternoon, and got to Houston at about close to 5. The concert was at the Toyota Center in downtown Houston. We arrived there at about 8:30 as the concert had the time to start at 9:00. The concert actually started at 9:30. The place was packed that night, as I had heard that a crowd of 12,000 people attended the concert that night. A judge from Harris County in Houston officially declared August 2nd, 2008 as Bollywood Day. HE started talking about the energy this show was brinThe first star to come out was Ritesh Deshmukh, and he was really good throughout the whole show. He came out and told everybody that he was really nervous opening up the show but after all the cheers and applause his fears and nervousness went away. After Ritesh left the stage, the next star to come out with Preity Zinta. She came out to the song “Where’s the party tonight”….After the song finished she came out and thanked everybody for coming out and also telling Houston that it was going to be a awesome show. After she left, the lights went out and the two screens on the left and right of the stage came on and showed pictures of Abhishek Bachchan. At that time, the crowd was going wild and cheering loud. When the lights to the arena came back on, everybody was looking toward the stage to see when Abhishek was coming out. BUT, he did not come out on stage. He came from the top row of the lower lever section and walked all the way down to the floor, with security and then on to the stage. Everyone was trying to reach him when he was walking from the lower level to the stage. The music to “One Love” came on, and as he came on s tage, he walked around and started waving to the entire crowd, and people were cheering loud. As he was on stage, a trolly came to the center of the stage, and he got inside it. The trolly rose up to probably 15 to 20 feet in the air, maybe more and started moving forward toward the crowd and audience. He was on the microphone cheering and telling the audience to yell out and make noise loudly. It was one of the coolest things I had seen any actor do..it was awesome!! When the trolly came back on stage, he started doing songs to Bunty and Babli. After he finished dancing to the songs he got on the microphone and was thanking the entire audience for coming out tonight and being so supportive and giving so much love to the Bachchan Family. He went on to say, “I am going to let you in on a little secret. Today is a very meaningful and very special day for the Bachchan Family. Today is my Father’s Birthday. He went on to say that his Father’s birthday is acutally in October, but today was his second Birthday and he wanted the fans to cheer and wish Amitabh a Happy Birthday when he came on to the stage. The reason for it being his second birthday that August 2nd, was the day that Amitabh Bachchan became well after the accident he suffered on the sets of Coolie back in 1982. It was on that day, that he got well and survived a fatal accident. I know all the Bachchan fans remember that scene where he got hurt on the sets of Coolie, and will never forget that scene. Anyways, as he was going along talking he tells everyone that the next performer to come to the stage is a very talented actress and is also extremely beautiful. At this time, Abhishek was walking toward the side where me and Waqas were sitting. Waqas being the dumb befkoof 🙂 he is, starts shouting “Bhabhi!!!! Bhabhi!! !”….as Abhishek was walking toward the opposite side of the stage from us, he stops about halfway, turns a round and looks at the direction of me and Waqas and he actually blows a kiss at Waqas….folks, I am not kidding!!! This is 100% true and a fact….it was so funny and hilarious…we could not stop laughing!! At that time, the lights went out again and a video was shown on Aishwarya Rai. She came on to the stage, and was performing to the music of “Dhoom”. She danced to “Crazy Kiya Re” and other songs from that movie. Overall, she thanked everyone for coming and hoped that everybody enjoyed the show. By that time, I was waiting and waiting for The King, THE TRUE KING, Big B to come to the stage…however, an announcer announced on the microphone that there is a very special star coming to talk about the effects of Global warming, and what was as Desi’s can do to help in this cause…..he introduced Jaya Bachchan to the stage, and she came out to a roar of cheer and applause. She started talking about Global Warming and the effects that it was causing to the planet and how we can help in this cause. After that, on the two screens of the stage Akshay Kumar came on the video talking about it also and asking the audience to please help in this cause. By that time, I had gotten my camera ready on video waiting for the moment to arrive when Amitabh Bachchan(THE KING!!) to come on stage….and it finally happened!! On the screens(left and right of the stage) the word “LEGEND” came out and appeared on the screen…..EVERYONE in the Toyota Center knew who was about to come out. They showed a 2 to 3 minute video on Amitabh(which I am PROUD TO SAY I have recorded on my camera, and still gives me chills and goosebumps watching it….by the way, I am going to put that on youtube for everyone to see…..it’s AWESOME!!). After the video was done, the dancers came on stage and started dancing to the song “Jahan Teri Yeh Nazaar Hai” from Kaalia(one of Delhi Friend’s favorite…right Prashant!!) and when Amitabh Bachchan appeared on stage the entire place went crazy!! People who were sitting on the floor almost all of them stood up and were taking pictures of Amitabh!! It was just an awesome scene to sit and watch the crowd!! He started singing to songs of Kaalia, Don and Sil Sila. People just loved it when he was singing “Rang Barse” from Sil Sila….the man was just AWESOME!! After he finished singing he thanked everybody for coming and thanked everybody for their love and support. From there, we had two guys who came out on stage to sing songs (Vishal and Shekhar) and they overall were okay….not that great, but who cared….I sure didn’t care about them!! After they had left, the next star that came on stage, in my opinion, got probably the second largest cheer and applause of the night and that was Madhuri Dixit. She first came on stage and danced to the music of “Dil toh Paagal Hai” and from there, she started dancing songs to “Beta” and “Tezaab”. She overally looked great, and gave a GREAT performance that night. People were cheering loudly for her….she was amazing!! After that, the lights went out, and it was dark throughout the Toyota Center….on the microphone came out Abhishek speaking, and said “Dad, I want you to know that I love you very much, and this next item I am dedicating to you”. When the curtain came up, you see Abhishek sitting on a munji, and he starts to dance to Kishore Kumar’s “Khaike Paan Banaraswala”…..the place went nuts!! He actually looked like Amitabh from “Don” in that scene and it was too too too cool!!!! After the song finished, you then started to hear the music to “Pardesia” from Mr. Natwarlal begin and you see Ashwarya Rai singing and dancing to it…..she is doing the part of Rekha, and then comes out Abhishek doing the part of Amitabh….again the place went crazy!! After they left the stage, and finished the song, again out comes Vishal and Shekhar….WHY GOD WHY!!!! They started singing songs from Bluffmaster and Bachchana Eh Haseeno……as they finished….not a moment too soon, you start to hear the music of “Sara Zamana” from “Yaarana” and all 4(Abhishek, Ritesh, Ashwarya and Preity) wore the the outfit that lighted up when Amitabh sang this awesome song…..as the song was going on, they formed a circle, and out comes Amitabh who sang the last two lines from the movie….the best part of it all was he was singing to it with Kishore Kumar in the background…..absolutely priceless!!!!! The dancers who were in the show, came out and did some dances from various films, and then the stars did a tribute on India and were dancing to different regions of India. First came out Amitabh who was dancing to the region of Punjab(YEAH BABY!!!). He danced first to the song from Khuddar(I love you!) and then to “Say Shava Shava”. After that, came out Preity who danced to the region of Kashmir….she danced to the song “Bhumro Bhumro” from Mission Kashmir. After that, Ritesh came out and danced to the region Maharashtra. From there, Abhishek came out and I can’t remember what region he danced to, but he and Aishwarya danced to a song from the movie “Guru” and everyone really enjoyed that number they did together from all the songs they danced to together from the show. You can really see from that number they did, that they really love each other and are very happy together…it was neat!! This song got them the most applause together. BUT, BUT, BUT the highlight by far was the dance performed by Aishwarya and Madhuri to the song “Dhola Re Dhola” from Devdas. When the crowd heard that Aishwarya and Madhuri were doing a dance together everybody knew that the song was going to be done and it WAS INCREDIBLE…I am not a huge Madhuri fan, but I have to admit….this was my first time seeing her perform and she rocked!! After that song finished, the crowd gave it a standing ovation, and they were all shouting “once more!! once more! !”…everyone wanted to see it again…..by this time, it was time for some magic….and on stage, comes back Amitabh Bachchan(THE KING!!) and he started to do dialogues from Kabhi Kabhie, Agneepath(which was awesome!!) and also Deewaar….I have to tell you guys that when he did Deewaar, the expression and the look on his face was just incredible!! While he was doing his dialogues, everyone in the Toyota Center went dead silent, and that is no joke!! It was completely silent, an d while he spoke…..no one said a word!! As he was doing his dialogue from deewaar, his facial expression was incredible, and yes he did cry at the end of that magical dialogue!! I DARE ANY ACTOR IN BOLLYWOOD, ANY ACTOR….YES EVEN THAT STUPID SHAHRUKH KHAN…A.K.A. “GOBI PAKORDA” TO TRY TO DO THAT SCENE AND HE WOULD NEVER BE ABLE TO DO IT….NO WAY, NO HOW! !” When he was doing the dialgoues, I shouted twice “YOU ARE THE GREATEST!!!! !” He was wearing an awesome awesome sherwani, and he looked too too too good!! At that age of 62, and to be doing dancing and performing with people half his age and him keeping up and teaching a lesson to them was just amazing….simply incredible!! After he did those, it was almost time for the show to be over. Out came Priety and Abhishek who started dancing to “Rock and Roll Soniye”….and then the lights went off again and then you heard the music to “Kajara Re” and the place was clapping and cheering loud like anything!! Aishwarya, Abhishek and Amitabh danced to the song and it was great to see!! The show started at 9:30 and finished close to 1:30 in the morning. By far, this was truly one of the BEST and most organized concerts I have ever been to. The security was very tight, so there was no way that anyone came on to the stage from the audience….but it was done so professionally and everyone was great and spectacular!! Boy, this is one long email huh!!! 🙂 🙂 I can’t tell you how much it was a blast for me. I paid $200.00 for my ticket, and I would not have minded paying for it again to see the show….I truly got my money’s worth….. It was too special and too great….I got to see my Idol, my Guru Amitabh Bachchan and he was THE GREATEST!!! The show was spectacular and it was just awesome!!! The seats me and Waqas had were just TOO SSSSWWWEEETTT We were on the side of the stage, in section 106, and we had second row seats…seat 1 and 2. To compare that to floor lever, is like saying we had 5th row seats center…..we were probably made 7 to 15 feet away from the stage…..it was awesome seats!!!! It was so worth the money!! I will be sending you guys pics from the concert in a day or two. I am definetely going to put that video on youtube for you guys to see when Amitabh Bachchan first came on stage….THAT WAS AWESOME!!! The video I have is like close to 8 minutes long….I will send it soon, so watch out for it. Thanks for letting me write you guys a HUGE EMAIL!!! Adios!! 1. Amitabh Bachchan(THE KING!!) – OF COURSE!!!! So what’s new?The Elephanta Suite. The portrait of the first Indian American elected to US Congress, Dilip Singh Saund, was unveiled in the House of Representatives recently. “The portrait, unveiled November 7, is part of a series dedicated to historically important members of Congress. Saund, who died in 1973, is recognized not only as the first Indian American to hold a seat in Congress — he was elected in 1956 and served three terms — but also as someone who helped pave the way for Indian immigration to the United States”. Over in Southeast Asia, Diwali festivities are just getting over in India – a NPR report talks about the origin of the holiday: “The Hindu holiday is often referred to as the Indian Christmas, but the meaning of Diwali is as complex as India itself“. In Pakistan, debate continues over President Musharaff’s decision to impose a state of emergency – the latest news quote him holding elections in January. In case you were addicted to watching Bollywood content on YouTube, you may want to take notice – there was a recent suit filed by T-series against YouTube/Google resulting in a Restraining Order. Finally,if you want an option from “Om Shanti Om”, the New York Times reviewed “The Elephanta Suite”, a set of three novellas set in India by Paul Thoreaux – Thoreaux has been called Somerset Maughm of our times by Washington Post – “Theroux’s new book of three novellas, “The Elephanta Suite,” is his attempt — brought off with mixed results but distinguished by worthy intentions and sturdy tradecraft — to display and explain contemporary India in all its swarming, seductive, anachronistic, disorienting dynamism. India’s contradictions seem to interest him most, especially its peculiar combination of ancient ascetic spirituality and information-age commercialism. Over here an ashram or a temple devoted to the quest for inner enlightenment or the veneration of Hindu gods, across the way a modern call center that fields complaints from Home Depot customers. Theroux hints in the book that India’s native novelists — or at least those who’ve won wide acceptance in America — have failed in some way to convey their country’s complexities, perhaps by emphasizing its picturesque folkways and exotic domestic customs as a way of enchanting Western readers. Theroux presumes to correct this situation by stripping some romance from the place”. The DFW Desi is a free, independent newsletter published to share current news, views and events pertaining to the South Asian American community – over 17,000 strong and growing!Please feel free to forward this newsletter to your friends. You may not be on our mailing list – to continue receiving this newsletter, please visit www.DfwDesi.com . To unsubscribe, please see below. 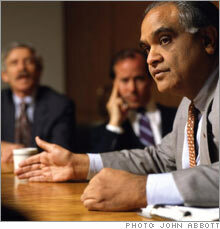 A new section in this newsletter, providing exposure to deserving South Asian Non-Profits. Suggestions welcome. is working relentlessly to generate self-employment opportunities for marginalized women and girls in rural as well as urban areas in India. Karma Kutir upholds the dignity of human life in all its activities. Diwali is usually a lucrative time of year for local Indian-American retailers and caterers. Now some mainstream businesses are catching on to the popular Hindu holiday and marketing to the area’s growing Indian population. In recent years, Hallmark has launched Diwali greeting cards, porcelain figurine maker Lladró has launched a line of Hindu deities and Wells Fargo and Citibank are running special promotions. Some companies are also using the time to build goodwill with clients and employees with celebrations and season’s greetings. Diwali, or Deepavali as it’s known in Sanskrit, is celebrated differently in various parts of India and has different origins for Hindus, Sikhs and Jains. “For marketers who are interested in the breadth of diversity among Asian Indians, it’s a good holiday to be associated with,” said Saul Gitlin, with Kang & Lee Advertising, an Asian-American marketing agency. See our ZeeTV commercials here! The proposal to create a Diaspora Knowledge Network and the recent launch of a swanky new animated logo by the Ministry of Overseas Indian Affairs demonstrates the growing awareness among Indian planners that it’s not just enough to attract NRI money – the knowledge and skills of overseas Indians could be worth far more. Uniquely designed to capture every aspect of the Indian subcontinent in over 50 American cities , indogram.com is the largest online directory of all local community events, businesses, and resources, providing up-to-date, accurate and comprehensive information. Whether it is movies or concerts, grocery stores or restaurants, dance teachers or priests, indogram.com offers a uniform, convenient, and user-friendly way to find information. Earlier this year, Indogram expanded its e-newsletter, Gram Sabha, from 3 cities to the entire country. Gram Sabha contains articles, humor, cartoons, and also links to , indogram.com’s extensive calendar of ongoing events and movies, containing more than a thousand entries at any given time. But indogram.com does more. One of its aims is to help businesses from the subcontinent on the net. With its help, hundreds of Indian, Pakistani and Bangladeshi stores now have a web presence. 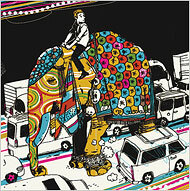 indogram.com also provides online ticket sales, discount coupons, and classified ads. So what’s new?The Kissing Game. Some sane people did comment on these controversies: “It is heartening to note that itâ€™s not the viewers alone who are exasperated with 24-hour news channels, but also the journalists who work in these organizations. V K Shashikumar of CNN-IBN news channel in his blog titled Moronic Media canâ€™t hide his disgust, disenchantment and disillusionment on the scenario. In a comment posted on his blog on April 17, Shashikumar wrote: â€œWe, the people working in TV news channels have made a superb opening on Monday with the Richard Gere-Shilpa Shetty kissing controversy. According to news channels, this is the most serious issue that the country should be debating this week. And so, like the conscientious pimp, an array of news channels in India are dressing up a â€˜not-worth-a-second-lookâ€™ subject into an ecstatic TRP stimulating exercise.â€ Along similar lines, someone else who has been in news for running afoul of the Indian “Cultural Police” is Mandira Bedi – “First it was her now-famous noodle straps that caught the imagination of a cricket-crazy nation, then a controversial tattoo on her back and now her sari that has dishonoured the Tricolour. On the cricket World Cup live show Extraa Innings, telecast on Sony Max on Saturday night, Mandira was seen wearing a sari that had an image of the Tricolour below her waist. According to Constitution, wearing the Triclour waist down is considered a dishonour to the flag”. Much has been written about the invasion of the Indian economy by large western conglomerates – now, a new survey finds some brands are preferred by India’s youth than others – “Moreover, with high cable television penetration rates, especially among the 200 million-plus middle-class households, Goel said many more Indians are closely watching the brands worn by both American and Indian celebrities and entertainers on networks like MTV or VH1. “There’s a cultural phenomenon in India that is quite pervasive,” Goel said. He described it as “foreign envy.” If you own something that’s from abroad, it sets you apart from your peers”. Controversy continues to swirl on the murder of Bob Woolmer, the coach of the Pakistani cricket team – the latest being a fatwah angle…“Woolmer was upset that several members of the Pakistani team were followers of ‘Tabliqhy Jamaat’, a Muslim revivalist movement, Pakistan’s media manager Pervez Mir indicated last night on BBC’s ‘Panorama’ programme, which focused on the coach’s murder in a Jamaican hotel six weeks ago. According to Mir, Woolmer felt players were focusing more on religion than their game. He went on to claim that Woolmer could have even invited a ‘fatwah’ had he gone public with his feelings”. What he does is hard to describe. But the most powerful CEOs love it enough to keep him on the road 24/7 and make him the most influential consultant alive. Fortune’s David Whitford reports. — The Al Manzil Hotel in Dubai has been open for business all of 18 days on the Saturday night in January that I show up with Ram Charan. The lobby is strangely quiet; there doesn’t seem to be anybody else staying here. The surrounding neighborhood is called Old Town, but in fact it’s a construction site from which are rising what will one day be the world’s tallest skyscraper and the world’s biggest mall. Soulless and kind of creepy, I’m thinking, but Charan’s thoughts are elsewhere. Already he has claimed an overstuffed chair in the center of the lobby and is talking on the phone. After 12 hours of isolation on the flight from J.F.K., Charan is back in business, deep in private conversation with a client in New York City. He looks tired, and no wonder. He began his day with a 4 A.M. Friday wake-up call in Richmond (he did a Squawk Box live remote on CNBC), and he has a head cold. But he is in no hurry to go to bed. Charan doesn’t care what time it is. He doesn’t care what day of the week it is. And the last thing he cares about is where he is. As long as Charan is with a client – or can get one on the phone – he’s home. Reading Mohsin Hamidâ€™s The Reluctant Fundamentalist, I was reminded of an incident during a coach tour in Britain years ago. My dining companionsâ€”a South African couple, polite but also largely uninformed about the world outside their backyardsâ€”had made a stereotypical remark about Indians: I donâ€™t recall the specific point (it may have been an expression of surprise that we could speak fluent English) but I remember bristling strongly. For someone whoâ€™s been dissociated from many of the important elements of â€œIndian-nessâ€â€”such as religion, rituals, strong family ties and the continual assertion of patriotismâ€”it was unnerving to discover this level of cultural sensitivity beneath a â€œcitizen of the worldâ€ facade. VIEW: Being a â€˜realâ€™ Pakistani â€” Rafia Zakaria The most interesting aspect of Hamidâ€™s Changez is that he is a â€œheroâ€ who is markedly un-heroic. Changezâ€™s pursuit of â€œwhitenessâ€, his pretensions and near-pathetic submissiveness to the dictates of the American moneyed class, make an interesting thesis regarding the immigrantâ€™s quest to become white. Pakistani immigrants (and many others), influenced possibly by their own colonial past and an American culture that reifies whiteness and presents being coloured as a disadvantage, devote themselves in their choice of friends, clothes, housing, even politics, to becoming white. The tragedy of such a hollow, misguided pursuit, one illustrated by Hamid in the crisis that ultimately unravels Changezâ€™s life, is that it creates a fake Pakistani-American identity. Prior to 9/11, this fake identity was unchallenged. After 9/11, the â€œothernessâ€ of the Pakistani was suddenly highlighted. In capturing this conflict through fiction, Hamid presents an urgent question to all Pakistani-Americans who believe that they can, through Ivy League educations and high paying jobs, buy their way out of being brown. Take a Swing at Ending Global Poverty! So what’s new?The Indian Economy. But first, just when you thought it was safe to travel by air (by forcing you to dump your 4 oz bottle of contact lens saline) comes the news about the man with infectious TB on a plane – “A man infected with the extensively drug-resistant form of TB known as XDR TB knew he was not supposed to travel overseas but did so anyway, director of the Centers for Disease Control and Prevention Dr. Julie Gerberding told CNN’s “American Morning” on Wednesday. The Bob Woolmer (coach of the Pakistani cricket team, who was murdered during the World Cup) saga is not over – seems like Bollywood wants to take advantage of the potential story – “Filmmaker Mahesh Bhatt, known for his sensitive and provocative human dramas, told the AFP news agency that cameras would begin to roll in August. Much has been written about Outsourcing and call centers, including the boom in the Indian economy because of that (see attached articles) – here’s a story with a twist – BBC reports that some enterprising non-profits are getting in the action to benefit their constituents – “Many of the country’s youth have more options in their hands and more money in their pockets than ever before. 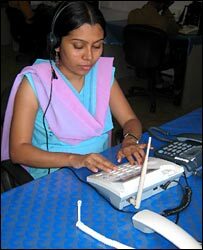 The blind do not want to be left behind and have now opened a call centre just for themselves in India’s financial capital, Mumbai (Bombay). The centre, Drishti (Hindi for Vision), is an initiative of the National Association for the Blind (NAB)“. Another angle on the growing Indian economy: The Newspapers. As the readership declines in the US and Europe, the Indian newspaper industry is booming : “Here, more than 150 million people read a newspaper every day — compared to 97 million Americans and 48 million Germans — circulation numbers are soaring, and advertising is expected to grow by 15 percent this year. The crowded Indian newsstand is a cacophony of scripts: In New Delhi, papers are published in 15 languages, ranging from English and Hindi to more regional tongues, such as southern India’s Telugu language“. Just before 5 a.m. on a recent Saturday, a few threads of dawn light were starting to show through the French doors that line one wall of the Baba Siri Chand Yoga Center in Millis. In the dimly lighted room, a half-dozen men and women wearing white turbans sat on the floor, reading prayers aloud in Gurmukhi, an ancient Indian language. “Ek ong kar, sat nam,” chanted members of this small community of Sikhs, followers of a religion far less known in the United States but with many adherents in India. “Even if you don’t understand, you still get the effects of elevating yourself,” said Jai Kartar Kaur. Her legs were crossed in front of her as she chanted. With the sky starting to look more blue than black, the room began to fill up. In front of the windows, Manjit Kaur Khalsa, a longtime member of the ashram community, instructed the group to briskly rub their hands together, bring them together in front of their hearts, and then inhale. Breathing out, they filled the room with the sound of “Om” — and yoga class began. The number one Bollywood blockbuster in India this week is Ta Ra Rum Pum, a traditional story of rags to riches with a few setbacks on the way. At one point in the film a couple persuade their children that they are only pretending to live in poverty, not because they really have lost their money but because they are part of a reality TV show. It’s just the kind of story that India loves. 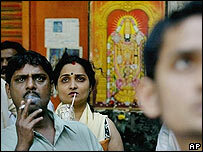 Not least because for hundreds of millions of Indians the movies is the easiest way of escaping reality. Take the slum of Dharavi in Mumbai (Bombay), home to a million people and a warren of small workshops, potteries and homes. Workers in Dharavi are mainly refugees from rural poverty, hoping to make their fortune, but they are also less educated and work in pretty grim conditions. were, “frankly, a huge amount of pressure,” he said.